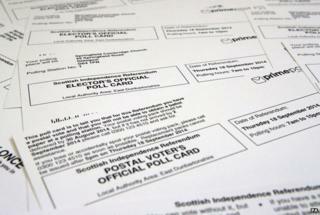 More than four million polling cards are being sent to voters in Scotland this week, ahead of the 18 September independence referendum. The cards, being dispatched on Thursday and Friday give registered voters information on polling places and how to cast their vote. Chief counting officer Mary Pitcaithly urged all eligible voters to make sure they were registered to vote. The usual voting age of 18 is being lowered to 16 for the referendum. Ms Pitcaithly, said: "Only people who are registered to vote and are aged 16 or over on the day of the referendum will be entitled to vote, so it is vital that those who want to take part ensure their details are on the electoral register. Applications to the electoral register must be received by electoral registration offices by midnight on 2 September, while applications to vote by post or by proxy must be received by 17:00 on 3 September. As of August, there were 4,166,683 registered electors on the electoral roll.